Made from durable materials, the contemporary all-steel Hartford Collection backless park benches offer smart seating, ready to inspire community. Functional and upscale with a sleek horizontally slatted seat, and a contemporary round tube frame. 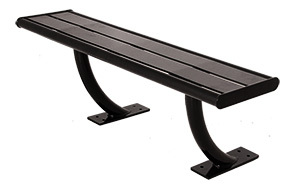 Engineered to be accommodating, aesthetically pleasing and long-lasting, these versatile 4' and 6' park benches are finished in an ultra-resilient, corrosion resistant powder-coating. Models are specifically configured for in-ground or surface mount applications.